This kit is so much fun to use and it means you can create some gorgeous cards very quickly, with very little effort. The designs are set out in a little booklet, so all you have to do is assemble them. I love the flowers in this card, they really compliment the watercoloured background. This is a complete kit that creates 20 unique cards. All you need to do is add your preferred adhesive. I use the Fine-tip Glue Pen to secure the sequins, and SNAIL adhesive for everything else. You may have your own preference, but I highly recommend those. In the kit you'll find the Watercolor Wishes exclusive photopolymer stamp set, pre-watercoloured card bases, envelopes, embellishments, 2 Classic Stampin' Spots (Night of Navy and Watermelon Wonder), cardstock flag stickers, die-cut flowers, an acrylic stamp block, Stampin' Dimensionals and more. 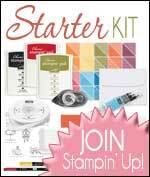 I really recommend this kit if you're new to Stampin' Up! or indeed crafting. This is a great kit if you haven't crafted for a while and want to get back in the swing of things.